Stevie Nicks Australian Interview DVD includes "My Top 11"
Stevie Nicks Today Show Performances 2005 and other various videos. Tusk Documentary and Concert and Tusk Photo Shoot DVD or VHS A quality Documentary from the making of Tusk, concert footage from St. Louis 1979. & the Tusk Photo shoot...cool video! Tusk Documentary Outtakes VHS or DVD Mostly A quality Outtakes from the Tusk Doc, extra footage of Stevie and Lidnsey working through Angel is very cool! Rumours Tour Outtakes**** 2 DVD set**** (VHS available) quality varies, good general Includes the complete Rosebud show, other live songs from Japan in 77. (an great GDW!) misc. interviews w/all band members, backstage footage from various 1977 shows, Stevie doing her hair and makeup backstage, hanging out with roadies, jam sessions, 1977 promo commercials, also contains Silver Springs in Germany in 1997. 3 � hours!! Awsome!!!! 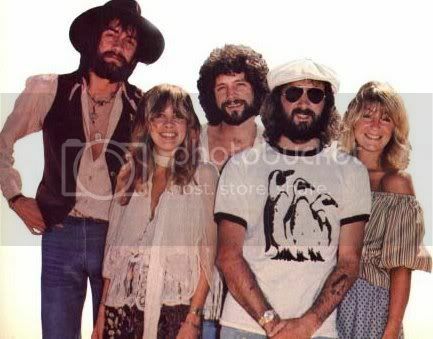 Fleetwood Mac - Japan Backstage 1977 ~ 1, 3, 5, 7, & 8 ~ 3 DVDs~ Recording Quality A- This DVD collection includes some of the above "Japan Outtakes" plus roughly two thirds new material from the tour of Japan in 1977. Fleetwood Mac Disney Special Going Home Doc. Quality A DVD ot VHS This is a documentary spanning the history of Fleetwood Mac, lots of great live footage, interviews and more. Fleetwood Mac Music Choice DVD or VHS A quality 2002 Documentary release at the time of The Very Best of Fleetwood Mac CD launch. Shown on Canadian TV with recent interviews, older interviews and live performances. Not that cool! Most stuff you probably have seen a million times. Fleetwood Mac Destiny Rules Documentary A+ DVD or VHS Documentary aired on VH1 following the band through the making of Say You Will.